GAMA was recognized as «The Best Software Developer for Institutional Investors» in 2016! As of March 31, 2017, GAMA manages 1,045 billion rubles of NPF assets (according to Investfunds). 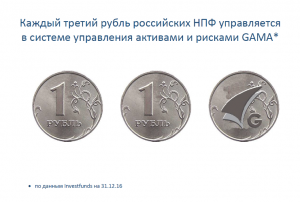 Today, every third ruble of Russian NPFs is managed in GAMA.